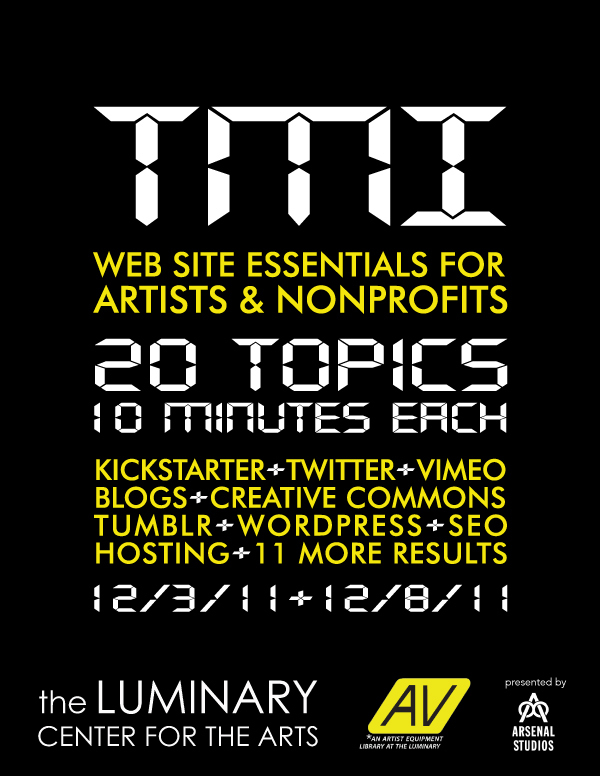 Temporary Art Review is please to announce TMI: 20 Topics for Success on the Web with Arsenal Studios, its second workshop in conjunction with The Luminary Center for the Arts. TMI will allocate 10 minutes per topic on a wide range of subjects that are crucial for web publishing success and improved visibility online. This will be a fast paced, high-energy roundtable where the instructor will be “working against” a countdown timer for each topic. When “time is up”, the class must move on to the next topic. Topics include search engine optimization, web publishing platforms (wordpress, tumblr,etc. ), preparing and optimizing media for web, effective social media usage, design and development shortcuts / strategies, and much more. This lecture will also be broadcast live online and a forum will be provided for offsite participants to contribute and interact. All proceeds benefit The Luminary. Fill out the form here to sign up! In conjunction with AV, a new membership-based artist equipment library, The Luminary Center for the Arts offers workshops led by local professionals to participants of all skill levels. Please see their full list of Workshops for more information.